Contact 1-800-450-5319 or submit the form for a FREE quote and more information on auto transport to Kyrgyzstan through A1 Overseas International! Transport to another country is often a tedious process that needs the attention of professional international auto shipping companies. The vehicle will need to be readied for the shipping process which includes inspections, the gathering of specific documents, preparing the vehicle itself, and other requested conditions. It all depends on the current policy held for auto import in Kyrgyzstan. The Embassy of Kyrgyzstan will be up to date on the vehicle import and export laws. Call them about two months before the scheduled international auto transport to have plenty of time to get everything ready. As soon as you are updated on the policies for vehicle import, you need to start fulfilling them. The transport company will make sure that everything is prepared properly for a secure shipping process. 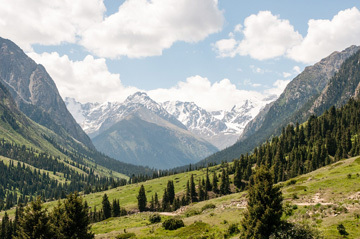 Auto import to Kyrgyzstan can be conducted when the proof needed for Customs is collected. This includes certifications and paperwork proving that a condition for import was met or to provide identification. Usually proof that taxes and duties are paid in full are also required. Other documents may be asked for. This is why it is always wise to call the embassy for the most up to date policies. This assures that the transport will be permitted into the country when you comply with the regulations. Prepare your automobile by cleaning it, checking the fluids, checking tire pressure, and making sure the gas tank is less than ¼ full. Fill out the form or call 1-800-450-5319 for a FREE price quote and more information on boat, motorcycle and car shipping!